‘Any information related to a natural person or ‘Data Subject’, that can be used to directly or indirectly identify the person. It can be anything from a name, a photo, an email address, bank details, posts on social networking websites, medical information, or a computer IP address’. For example, specific permission for each type of processing (post, email, telephone) and also asking permission to past details onto a third party. Individuals need to know they have the right to withdraw their consent. In terms of your web user experience, this means unsubscribing could consist of selectively withdrawing consent to specific areas previously interested in such as accounting, business, cyber security, finance. Your web forms must clearly identify each party for which the consent is being granted. It isn’t enough to define categories of third-party organisations – they must be named. You will need to update your terms and conditions on your website to reference GDPR terminology. Specifically, you will need to make it transparent what you will do with the information once you’ve received it, and how long you will retain this information both on your website and also by your office systems. Here at (company name), we take your privacy seriously and will only use your personal information to administer your account and to provide the products and services you have requested from us. We would also like to pass your details onto other (name of company/companies who you will pass information to)/(well defined category of companies), so that they can contact you by post with details of (specify products/offers/services/competitions) that they provide. If you consent to us passing on your details for that purpose, please tick the box to confirm. If you are an e-commerce business, then you are likely to be using a payment gateway for financial transactions. Your website may be collecting personal data before passing the details onto the payment gateway. Many websites are using third-party marketing automation software solutions on their website. For example, it must be made clear if Cookies are being used. Many websites are configured to use Google Analytics to track user behaviour. Google Analytics has always been an anonymous tracking system. 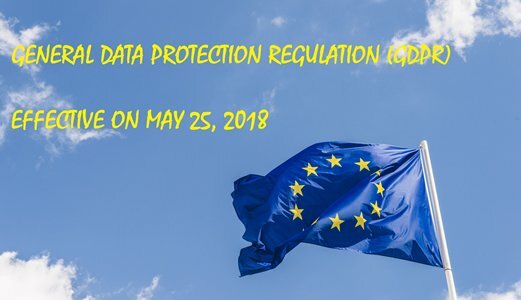 There is no “personal data” being collected, so GDPR does not impact on its usage. You will need to identify and have in place contracts with your third-party data processors to protect both your own interests. Any data that is submitted to your website must be encrypted in order to comply with GDPR to stop your website being hijacked. Speak to us at Format.ie to discuss getting an SSL certificate (see other blog on SSL certificate) fitted to your website to encrypt the data. Penalties for non-compliance include fines of up to 4% of annual global turnover.